It would be remiss for any discussion of The Admiral: Roaring Currents (명량) not to examine the colossal achievements the period film has made. Director Kim Han-min’s (김한민) film has broken seemingly every Korean cinematic record the country has – the fastest film to gain over 10 million viewers (12 days); the most viewers on an opening day (682,797); the biggest opening weekend ($25.94 million); and the first film to attract over 1 million viewers and 10 billion won in a single day, amongst other similar milestones (source: KoBiz). To call The Admiral: Roaring Currents a success is an understatement of the highest order. Yet the accomplishments have not come without marked criticism. 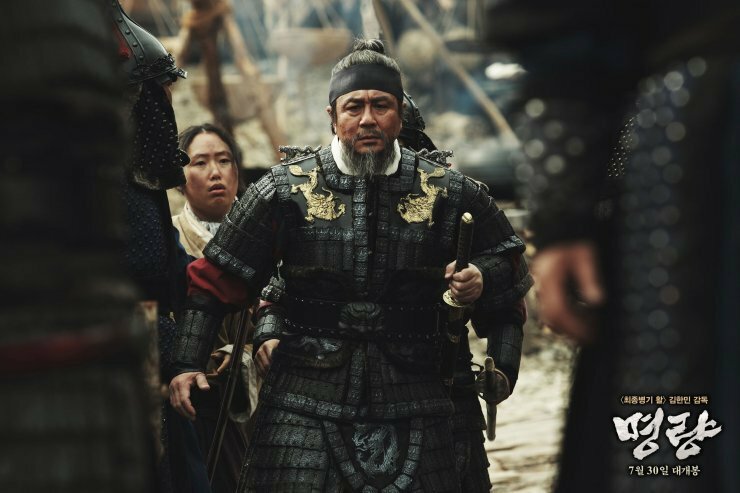 Of the 2,584 cinema screens in South Korea, The Admiral: Roaring Currents initially occupied over 1,500, during a time of school vacations and oppressive summer heat. Bolstered by a 3 billion won marketing strategy by the country’s largest distributor CJ Entertainment, which combines with the biggest cinema chain CGV to form the conglomerate CJ-CGV, debates concerning the monopolization of the industry by chaebols have again risen (sources: Variety, The Hankyoreh). With all the success and criticism aside, the question remains – does The Admiral: Roaring Currents live up to the hype? The answer is, perhaps unsurprisingly, a resounding no. While it’s a well-made historical yarn, the simplistic script, weak characterisation and insanely – and often comically – overt nationalism detract from the film, making it less of a war epic and more of an entertaining matinee. The year is 1597. Admiral Yi Sun-shin (Choi Min-sik (최민식), the most fearsome – and unbeaten – naval commander in the history of Joseon (Korea), who has been imprisoned and tortured by the very country he fought for, is finally acquitted and released. His task is not small. With only 12 ships at his command, Admiral Yi must fend off the impending invasion of 330 battleships belonging to the Japanese navy, led by pirate Kurujima (Ryoo Seung-ryong (류승룡) and General Wakizaka (Jo Jin-woong (조진웅). Against all odds, Admiral Yi must not only engage his enemy but also overcome the fear gripping his men, to defend Joseon from colonization in the famous Battle of Myeong-ryang. 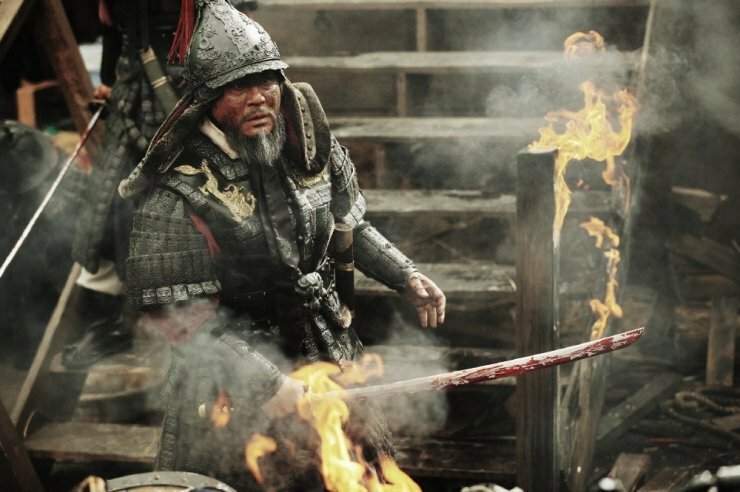 The great strength of The Admiral: Roaring Currents lies in director Kim Han-min’s vision and incredible ability in capturing adrenaline-fueled scenes of carnage. Director Kim has already proved his kinetic prowess on the fun action-adventure War of the Arrows, yet with the larger budget and scale of The Admiral he surpasses himself to display a genuine evolution in style. Given that the Battle of Myeong-ryang itself takes roughly half of the film’s running time this is a particularly impressive feat, as director Kim uses every means at his disposal to make the conflict as thrilling, compelling, and downright entertaining as possible – and it works. Warfare is dramatically captured through a variety of techniques, from establishing shots conveying the scale of the battle and the horrifying size of the invasion, to smaller intimate scenes of bloody hand-to-hand combat and exciting quick changes in strategy. In one exhilarating long take the camera moves around the deck of Admiral Yi’s ship as he and his men clash violently with their foe. Plus, in a moment of inspired genius, The Admiral features Buddhist warrior monks cleaving Japanese forces in two, which never fails to raise a smile. Unfortunately such sensibilities haven’t been extended to the script, which is generally really poor. The complexity of the period is constantly simplified and subsumed beneath incredibly overt nationalism, which is a real source of frustration. Whether it be the blinked-and-missed-it scenes of Admiral Yi’s torture at the hands of the country he defended, or the shambles of a navy that he inherits upon release, the lack of exploration of such issues really halts any audience investment in the historical figures/characters themselves. There is an attempt to add empathy by conveying Admiral Yi’s post-traumatic stress from torture as well as the relationship with his son, but again, they really are fleeting and add very little to the overall story. Instead, the film consistently strives to deify Admiral Yi, presenting him as an omnipotent saviour figure. This gives actor Choi Min-sik, who is undisputedly a phenomenal talent, very little material to work with, largely requiring him to look determined and to adopt the statuesque posture for which he is renowned. The most obvious heavy-handed nationalism unsurprisingly appears in regards to the Japanese invaders. Visually, their costume design and make-up is frankly awful, which combines to convey them as one-dimensional drag acts sent from hell. This is acutely the case for Ryoo Seung-ryong as pirate-turned-general Kurujima, whose devil-esque costume and thick black eye-liner are laughable. The most comical moments however are reserved for the dialogue as Ryoo, on multiple occasions, is required to snarl and exclaim, “YI SUN-SHIN!” whenever the Admiral does well, inducing sniggers. 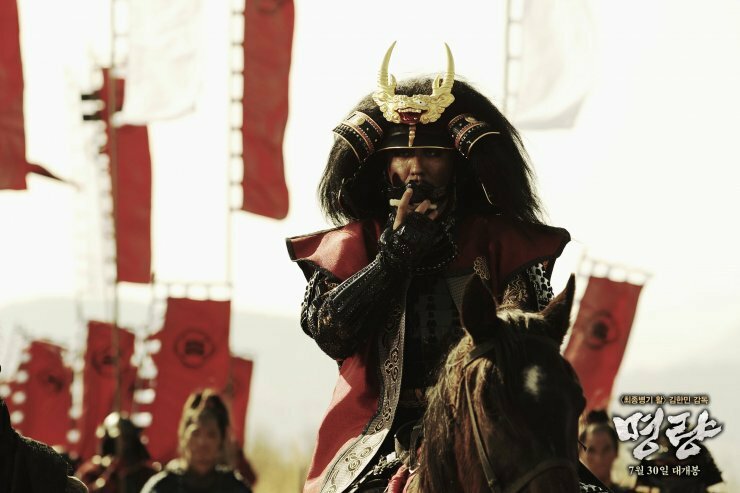 The Japanese forces are undoubtedly the villains of this historical event, yet portraying them in such a simplified shallow manner undermines Admiral Yi’s achievements both in the past and on celluloid. The Admiral: Roaring Currents is arguably the most financially successful Korean film of all time, shattering a multitude of box office records during its phenomenal cinematic run. 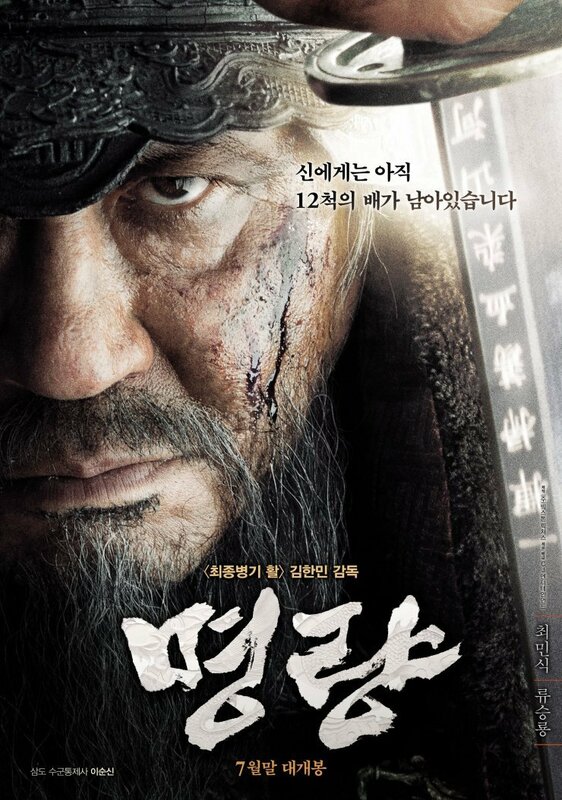 Director Kim Han-min’s war-drama featuring revered Admiral Yi Sun-shin is nothing short of a filmic sensation. The film itself however, while a well-made historical actioner and displaying a genuine stylistic evolution by director Kim, suffers from a poor script, weak characterisation and over-zealous nationalism, combining to make The Admiral: Roaring Currents less of a war epic and more of an entertaining matinee. One thing i wanna let u know(as a korean) the reason this film can be successful is about a Leader. Lots of koreans especially young ppl are disappointed with their government including the peresident. Like you mentioned, typical nationalism works for koreans. But also they realize what kind of leader they want after watching the film. Hello Jake, thank you for taking the time to write a message. Yes you’re absolutely right, a lot of Koreans have said that they watched the film because they want a vision of strong leadership. The problem is, however, that the way Admiral Yi is represented is not so much as a leader, but more of a divine, infallible being. A lot of the criticism from foreign press has focused on this issue, which is inherently tied to the representation of Korea/Koreans as 100% good, and Japan/Japanese as 100% evil, which over simplifies the true events in the spirit of nationalism. Thanks for your message!